To deliver positiveness and kindness from sick players, also offer our donation and attentions to sick children. While interacting with our players as usual, we learned that two of our players had the misfortune of being stricken with leukemia. Impressed by how brave they were in their fight against cancer, we contacted them and asked if they would be interested in a donation plan. Generously, they both refused and insisted that any donation be given to people who need it more. Because of this incredible act of kindness on their behalf, we have decided to honor them as charity ambassadors for this event. 1.During the event, players can get the Wing of Love when they do any amount of recharge. One player can only get one pair of wings in this process. 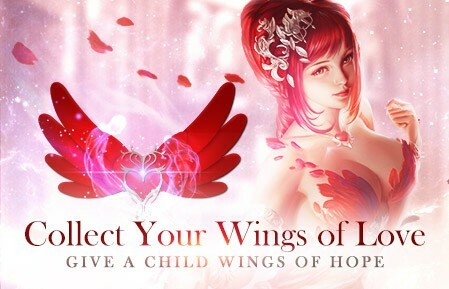 2.During the event, for each pair of wings, our company will donate 10 cents to Child’s Play. 3.Players can follow this event on Facebook, forum and the theme page. Blessings to sick players and children are highly welcomed. 4.Donation of our company will be delivered to Child’s Play at the end of this event. The Child's Play Charity works to channel the goodwill of the worldwide gaming community into video games and game systems for sick children in hospitals. Child's Play works directly with hospitals worldwide to identify what kinds of games and systems can be installed in hospital wards and distributed "for keeps" to child patients. Since 2003, Child's Play has coordinated the donation of millions of dollars of games and game systems, making them a premier charity for helping children in need of the joy that games can bring.